These workers' dwellings for the socialist housing association De Dageraad ('The Dawn') were designed by the two leading exponents of the Amsterdam School, M. de Klerk and P.L. Kramer. Built with a council subsidy, they satisfied all the imposed conditions - a maximum of four levels, staircases in direct contact with the open air, the greatest percentage of space for the living rooms, and so on. 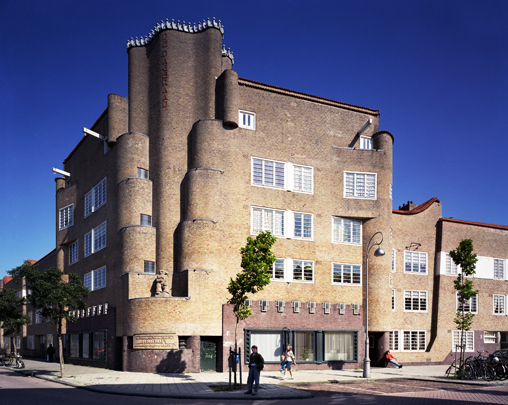 Though Amsterdam School architects in particular were often brought in to embellish facades of standard housing blocks, in this case the floor plans, too, are the work of De Klerk and Kramer. The complex consists mainly of three- and four-room units which meant for its new tenants a considerable improvement in living standards. This and the even greater attention paid their exteriors were largely due to the untiring support of socialist alderman Wibaut in the face of accusations of extravagance and unnecessary embellishment of the facades. His bust forms part of one of the street corners. De Klerk's main contribution was the housing on two squares, Th. Schwartzeplein and H. Ronnerplein. The dwellings are assembled in groups separated by deep recesses in the roofline. De Klerk's work here is a lot less busy and exuberant than that at Spaarndammerbuurt. He also designed the frontage along P.L. Takstraat. The Z-shapes created by staggering the groups of dwellings and linking them with a plant box at each entrance, lend the street walls a dynamic quality. Kramer was responsible for the housing on Burg. Tellegenstraat, W. Passtoorsstraat and Talmastraat. The most impressive feature is on the corner of P.L. Takstraat, where undulating vertical planes rise up sheerly from the stepped curves of the front facades. The two schools terminating the ensemble on the Amstelkanaal side were designed by Amsterdam Public Works. All entrance sculptures are by Hildo Krop. The Coöperatiehof (1925-1927) was likewise designed by Kramer. Visitor's centre De Dageraad: Burgemeester Tellegenstraat 128.